There’s a terrific Farmers’ Market I visit every Sunday, the Atwater Village Farmers’ Market. Conveniently, it’s 5 minutes from my house, and also directly across the street from Bikram Yoga Silverlake where most days I am either torturing people or being tortured in what we lovingly refer to as ‘the hot room.’ (Best workout on the planet. But I digress.) “Farmers’ Market Sundays” have helped create traditions at the house. A few times a year, for instance, we have a Farmers’ Market Dinner, where friends bring to the house whatever they liked from their Farmers’ Market. We cook it all up and have a great meal. “Farmers’ Market Sundays” also led to Sunday Night Vegetable Roast. A little backstory: I often take time on Sundays to cook. I make broth, I put up vegetables and fruit, I prep for the week. My hometown friend Doneane Beckcom Reese recently turned me onto Salad In A Jar, which works incredibly well and gives you fresh, ready made salad every day. Wine is certainly most always involved and I’m usually writing at the computer at the same time. For me, it’s a great way to relax before Monday rears its head. Also, if you double or triple your quantities, you have a bunch of vegetables that will keep all week and be ready for a plethora of fast prep dishes. It makes breakfast very easy, for instance. As an avowed egg fanatic, I can attest that roasted vegetables in your fridge help create excellent breakfasts every morning. Below, then, I’ll tell you how to best roast your vegetables, and then give you some of the varied dishes you can create with them later in the week. Try doing this some Sunday. Even if you are not much of a cook or are too busy to cook much during the week, taking a couple of hours on a Sunday to prep food is a great idea. You can precook a bunch of different things, all at once, and have a lot of tasty items to pull from the fridge. Roasting vegetables is easy. Seriously. 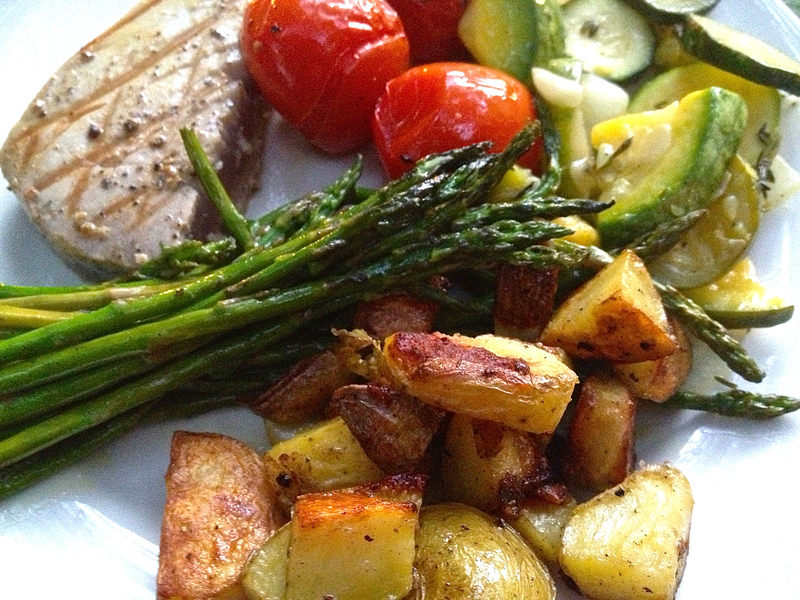 Take, for instance, the tomatoes and asparagus pictured below. You toss them with a little olive oil and salt & pepper, stick them in a 400 degree oven, and roast. That’s it. I don’t know of a single vegetable that won’t work perfectly this way. Cooking time differs, certainly. Asparagus roast fast.. only a few minutes if they are thin, perhaps 10 minutes if they are thick. Tomatoes… well, it depends on how you like them. I like to roast tomatoes down big time, maybe even get a little bit of black here and there. So for tomatoes this could be 45 minutes to an hour. For you, 30 minutes might be ideal. Just check the oven every ten minutes or so, you’ll know when you want to pull them out. Cherry tomatoes are perfect for this prep, btw. They are little pops of wonder in your mouth.